Big BIG FINISH Week: Doctor Who - THE SIRENS OF TIME Review | Warped Factor - Words in the Key of Geek. Tony finds himself back at the beginning. Beginnings are funny things. You never know what’s going to become of them – whether they’ll flourish and succeed or crash and burn. Looking back at beginnings, seventeen years on, is nothing less than time travel, going back to the start from a point where you can, where things have worked out. Listening to The Sirens of Time from the vantage point of 2016, it’s almost impossible to keep an affectionate smile off your face. An indulgent, ‘If only they knew’ chuckle out of your voice. But let’s try, shall we, because nostalgia is only part of what Big Finish, and what The Sirens of Time, is about. Yes, back in 1999, when it was released, we were half a decade away from Doctor Who’s triumphant return, and so, yes, there was a sense of fanboy ‘Let’s do the show right here’ bravado about the first Doctor who release from Big Finish Productions. It was almost inevitable that if you were going to do a thing like this, with the real Doctor-actors, you’d want to bolt out of the gate with a multi-Doctor story – triple your headline value, triple your chances of being ‘must-listen’ material. Setting off with a multi-Doctor story would mean the armies of people just like you who loved the show, and bought the books and still held the torch of the Doctor in their hearts, would buy it just because you’d managed to get three surviving Doctor-actors in it, and were able to legally, unashamedly call them the Doctor. In terms of a central idea, The Sirens of Time is suitably grand – the Sirens of Greek legend lured sailors to the rocks of their destruction with a beautiful song. Presumably, the Sirens of Time would do something similar to time travellers…for some reason. And listening to The Sirens of Time in 2016, you can hear the comparative simplicity of the story structure – Nicholas Briggs clearly wanted to deliver a solid story for each of his Doctors, so each of the first three episodes focuses on a single Doctor in a different situation, meeting a young woman who makes little sense, she and the fact that he can’t get back into the Tardis once he’s left it being the threads that most bind the sub-stories together. The individual stories they find themselves involved with are curiously non-specific: the Fifth Doctor, on board a World War I German submarine with an English girl from the ship it was attacking; the Sixth at a symposium for cleverclogs, staring at a spacial wonder; and the Seventh landing somewhere and running to help a girl seemingly drowning in quicksand, and uncovering a bizarre punishment plan for an ageing war criminal. Really speaking, any Doctor could find himself in any of those situations, and it’s deceptive how little Doctor-specific ‘Hmm’ing or ‘Come along’ing there is on the page of any of them. Briggs allows each Doctor-actor to find their way back into their character after, in Davison’s case at least, more than a decade out of the Tardis. That being the case, the three actors all give slightly different performances to the ones most familiar from their TV incarnations – partly because audio is a different medium with different demands, partly because each of them had had time to reflect on their stints in the on-screen role and had matured as actors, and perhaps in Colin Baker’s case, partly to redress an inaccurate perception of his character as unlikeable and spiky. Certainly, of the three, it’s palpably Baker who’s most immediately and completely at home in the audio medium, carrying the thread of his TV incarnation forward but mellowing it from the explosive on-screen version of the Sixth Doctor. He’s charming but canny, this Sixth Doctor, which the TV version was too – but here he’s in control of his personality more than he was usually allowed to be on-screen, and the change is remarkable – suddenly, even if you never got it on-screen, the Sixth Doctor’s personality makes sense. McCoy, perhaps logically, plays his Seventh Doctor closer to the version in the TV movie than the version of his Ace-days, and as such is less the moody Machiavellian, more the quiet old man, taking the opportunity to do good deeds where he can. Davison too sounds perhaps older and more considered, but like a Time Lord set free. Although none of these Doctors ever went without companions, Davison’s Doctor was rather wore weighted down with companion story-threads, and to hear him entirely free in a situation of intense intergalactic peril feels more instructive on the kind of Doctor the Fifth really was, if ever he was given a chance to be himself. Here he lies freely to get his way, in a rather glorious callback to the first three Doctors, and makes you yearn for the stories the Fifth Doctor never got to star in – the perfect emotion to stir in fans of the show if you happen to be writing and producing a line of audio stories that can take him on those adventures. 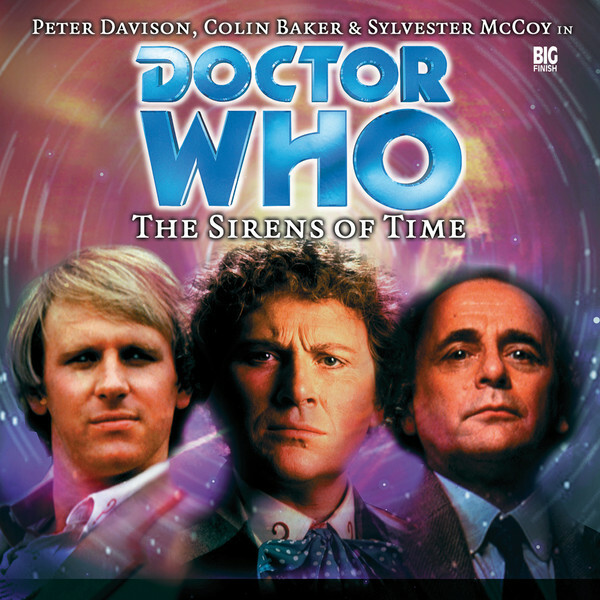 In essence, all three of the Doctor-actors bring something to The Sirens of Time that would make you want to know more, make you perhaps take a chance on their first individual Big Finish stories when they were released. Of course, as a multi-Doctor story, much of the chemistry depends on the ways in which your three Doctors relate to one another. What’s peculiar and interesting about that here is the reaction of the Sixth Doctor. Always the most cantankerous of the three, and famously dismissive of the ‘feckless charm’ of his predecessor, you almost expect the sparks to fly between Doctors Five and Six. But instead, Briggs’ script, and more particularly the actors’ performances, have the Sixth Doctor more at odds with his diminutive future self, who counters his very English bluster with a barely audible witticism or a chuckle. It’s a part of the equation we never got to see before – what this prickly Doctor would think of being replaced by someone who looked and sounded like Sylvester McCoy, and it has an extra piquancy of course given the way in which the replacement was arranged in real life. The Doctor-actors certainly deserve praise in The Sirens of Time for giving life to the lines in the very particular ways that show you why they were chosen to play the role in the first place, bringing their signature styles to the piece but moving them on from the TV versions, so that at least, whatever happened to Big Finish, The Sirens of Time would be a piece of work of a quality that deserved to have their names on it. There are solid performances from other significant actors too – Mark Gatiss is here at the beginning, and Sarah Mowat pulls multiple-role duty, though she differentiates her characters sharply, so as to give them all different companion-qualities to each of the Doctors. Future Sixth Doctor companion-actress, the fabulous Maggie Stables here gives us a more officiously revolting character The Dalek brothers, Nicholas Briggs and Nicholas Pegg, are here in small roles too. And while in all probability this was story-specific at the time, from the vantage-point of seventeen years on, it’s thrilling to note that the Doctor’s ongoing relationship with Time Lord CIA operative Vansell begins right here, Big Finish unafraid from the very beginning to take what we knew of the Time Lords from their on-screen appearances and run with it, inventing extensions to our previous knowledge and giving its additions a polish that would stand up to repeat listening. The Sirens of Time is a simply constructed storyline designed to both invoke a degree of nostalgia and, crucially, take what we know forward into new places. When it was released, it was a new ‘three Doctors’ story, and it promised quality production values and the translation of Doctor Who into an audio medium in a much more exciting way than the likes of Slipback had done. Still, seventeen years on, The Sirens of Time gives us a solidly, if simply, put-together piece of Doctor Who audio that repays a re-listen, and promises goof things to those who follow the Big Finish Doctors on their adventures.